By now most of you know I'm a loyalty points junkie and a big fan of the American Express Gold Rewards Card. Having signed up a year ago, I've already taken advantage of my points and jet-setted around Europe this summer. As I was checking out what else I can redeem my points for in the Membership Rewards catalogue, I discovered Samba Days Gift Experiences. These are pre-packaged themed gift cards that you redeem for activities - which makes gift giving for the person who has everything, unique and super easy... or you can just treat yourself to one of their 500 experiences across Canada! Starting at 7,500 to 42,000 points all you have to do is visit the American Express Membership Rewards site to redeem your Samba Days Experience and they will deliver the gift card right to your door. Choose from wine tours, gourmet getaways, spa treatments or even own a Ferrari for the weekend! 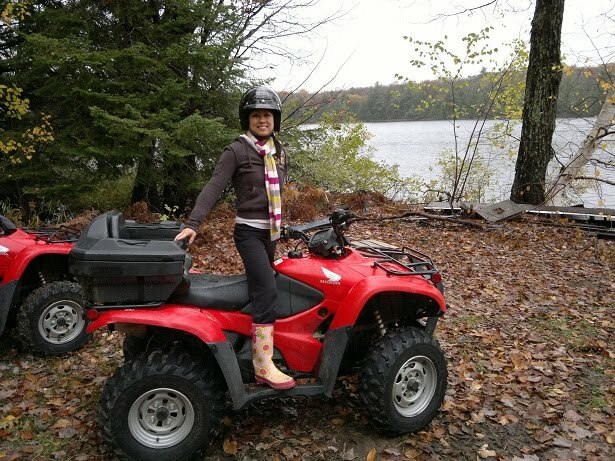 For 28,000 Membership Rewards Points, I was able to surprise my hip and urban husband, Geoff with an ATV Adventure out in Georgian Bay last weekend! 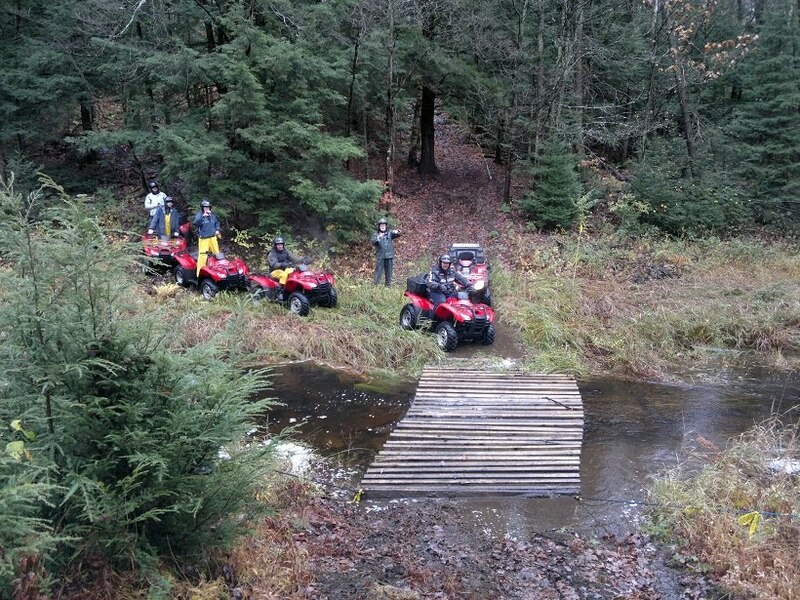 Samba Days has partnered up with Bear Claw Tours to host ATV Adventures. The tours are done in small groups and last 3-4 hours, covering over 1,000 acres of twisty pioneer trails, gravel hills, a beaver dam, mud and more mud. Instructions are provided by Andrew (he's also the Owner) and Kevin (his trusty sidekick / Head Guide) and so is the hot chocolate and safety gear. FYI... They have a pair of pink floral boots on hand to keep us hip + urban girls dry and fashionably coordinated. 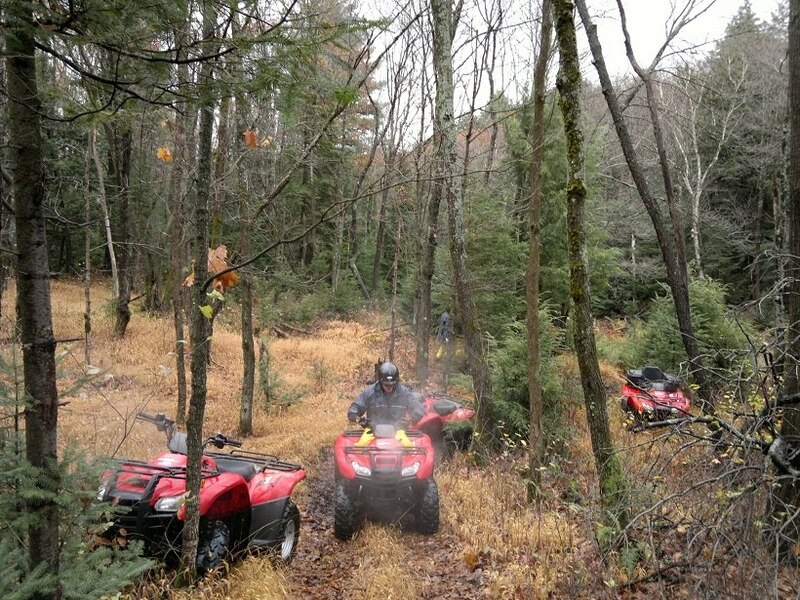 The ATVs are lean mean machines - 400cc or equivalent to 30 horses. Which is a good thing because you never know when you'll have to outrun a bear! Luckily, we didn't see any during our tour and I happily tackled the dirt and puddles while enjoying the forested oasis filled with pretty shades of reds, oranges and yellows. By the end, I was living on the edge - wind blowing through my hair, adrenaline pumping in my veins, jumping logs, going through cranberry bogs and nearly getting stuck in puddles that were 2 feet deep. Nothing short of riveting and unforgettable of course, thanks to Samba Days. Now it’s your turn to check out your own Samba Days experience! American Express Canada is giving away 1,000,000 Membership Rewards points to ONE lucky American Express Card member! Starting today, fans can enter by visiting the Points tab on the American Express Canada Facebook page. Leading up to the Million points giveaway, American Express Canada is also giving away weekly prizes – so come back every week to enter and increase your chances to win the Million points! This week's prize is a Samba Days Gift-experience so check it out!